32 More Days Until Autumn! Fall starts September 22, 2016. Looking west along the Chicago River in Chicago's North Park neighborhood. 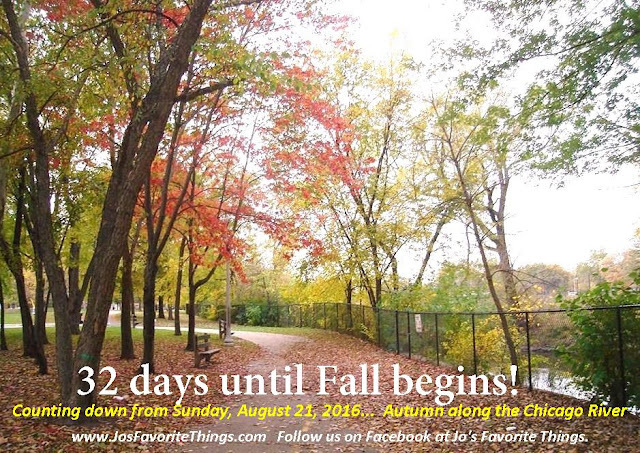 For those of us in the Northern Hemisphere, Autumn is really not that far away... 32 more days! Autumn greets us (or we greet Autumn) on September 22 at 9:21 a.m. Central Daylight Time, this year, 2016. That's 10:21 a.m. Eastern Daylight Time, 7:21 a.m. Pacific Daylight Time, and 14:21 UTC (Universal Coordinated Time). After a long stretch of humid, 85+ degree days here in August, Autumn (or Fall), with beautiful bright days and cool nights, is very welcome! The September equinox (or Southward equinox) is the moment when the sun appears to cross the celestial equator, heading southward. Due to differences between the calendar year and the tropical year, the September equinox can occur at any time from the 21st to the 24th day of September. At the equinox, the sun rises directly in the east and sets directly in the west. Before the Southward equinox, the sun rises and sets more and more to the north, and afterwards, it rises and sets more and more to the south. In the Northern Hemisphere the September equinox is known as the autumnal equinox. In the Southern Hemisphere it is known as the vernal or spring equinox. And just in case you forgot that the tilt of the Earth is responsible for the seasons, here's a good link that explains that whole thing. So.. what do we have to look forward to this Autumn? To me, September has always meant the start of school even though most kids start school before Labor Day in the US now. I guess I'm a traditionalist at heart. Tomatoes and zinnias are bountiful in early September, and it's time to get the last barbecue of summer fired up. In our family, we celebrate many September birthdays. Labor Day is late this year, 2016, on Monday, September 5th! By the end of the month, the nights are cooler, and the leaves are starting to change colors. Chrysanthemums and asters (Michaelmas daisies) are in bloom, and we celebrate a few more family birthdays. Farmer's Markets are overflowing. And another football season begins. October is full of beauty, golden and red colors, gourds, squashes, especially pumpkins, haystacks and hayrides, and the last apples straight from the orchards. In our family, another birthday or two.. and, this year, a big wedding! Then we move on to witches, ghosts, goblins and Halloween.. and the end of Daylight Savings Time as we plunge into those longer, dark nights. Halloween is on a Monday this year.. Not a great day for Halloween, but that's just the way it is. Daylight Savings Time ends early Sunday morning, November 6th, 2016. "Fall behind" and enjoy that extra hour of sleep! November brings Thanksgiving in the United States (November 24 this year, 2016) and the start of the Christmas holiday season. As a kid, November always seemed just cold and grey, but now that I'm older, I really appreciate the peaceful quality of November. The gardening is done; the craziness of the Christmas season hasn't yet started, and those empty branches against the deep blue of an early sunset are always stunning. Then we usually have a few magical sparkling snowflakes sometime in November. I absolutely refuse to turn on the oven when the air conditioning is running, so Autumn means a return to baking, casseroles, breads, soups and stews. I always promise myself that I will try more new recipes than I actually do, but I'm definitely going to make that wonderful apple cobbler with home-whipped whipped cream that I made almost every year when my son was little.. if I can find the recipe. And there will definitely be meatloaves and lasagna. Definitely! So let's start counting down those days until Autumn.... 32 days until Autumn today. (It's Sunday, August 21st, 2016.) Every week will be a little cooler, a little more pleasant than the hot weeks we've had recently. It will be nice not to have to water as often. And we've all started to notice how early sunset comes these days. I'll miss the long evenings, but it will be great to have lower air conditioning bills starting in mid-September.